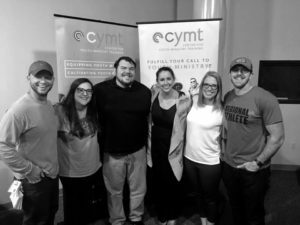 If you are looking for practical training and theological education in youth ministry in a format that allows you to stay at your church, then CYMT’s Training Only Program is perfect for you. Graduate residents in the Training Church Program can receive practical training and earn a Master of Arts in Youth Ministry through one of our partner seminaries while they work at their church. CYMT offers regional campuses in Tennessee and Texas through partnerships with Memphis Theological Seminary and Austin Presbyterian Theological Seminary. Training churches are from multiple denominations within a four-hour radius of Memphis, TN and Austin, TX. Acceptance to the program is competitive, as the cohort spots are limited. The training church pays tuition for their youth minister to receive the same benefits of a graduate resident. Residents are part of a dynamic, group learning community that provides encouragement and support as they walk through ministry together. Residents receive one-on-one coaching from a youth ministry veteran to help master and apply critical skills. In retreat-style, four times per semester, residents will be challenged to think theologically about ministry and empowered to create ministry programs that evoke deep, life-changing Christian faith. Residents get hands-on experience in a local church where they serve 25 hours weekly as the youth minister. Veteran youth ministers (5 years of experience) can earn their Master of Arts in Youth Ministry through CYMT’s partnerships with Memphis Theological Seminary and Austin Presbyterian Theological Seminary. Veteran Youth Ministers do not receive coaching, but receive all the benefits of the CYMT community. CYMT operates a rolling admissions process that begins on September 1 each year. There are three phases to the process that evaluate the theological fit, clarity of call, academic ability, and practical readiness of all presenting candidates for our residency program. Candidates who complete Phase 1 by May 15 receive priority. Candidates applying after May 15 will be considered for admission as space allows. Phase 1 is comprised of an online application and questionnaire that gives CYMT insights into your theological fit, the clarity of your call, and your practical experience. The online application takes 30 – 45 minutes to complete. A $50 application fee (or submission of a referral code) is required with your application. After submission of the Phase 1 requirements, CYMT will contact you within three business days with a decision about advancement to Phase 2. Phase 2 requirements include answering several short answer questions; writing an academic essay; supplying three references; and submitting your unofficial undergraduate transcripts. After completing Phase 2, CYMT will contact you within ten days about whether or not you will advance to Phase 3. Phase 3 is a one-hour interview with some of our leadership staff. After the meeting, CYMT will be in touch within 10 business days about your acceptance to the program. Want to know more about CYMT or a particular program? We’d love to send you more information!